Afternoon drive in the Bausher dune area... as always when we plan a trip to Bausher more than 24 hrs in advance, this one was a scorcher at over 40�C late in the afternoon! Last changed on 01/25/17. This album contains 16 items. This album has been viewed 4015 times since 07/18/05. Playing behind the ABA grounds was great fun, had to go back the next day! Check out the 3-wheeling shots of the URO Vamtac! Last changed on 01/19/17. This album contains 24 items. This album has been viewed 6261 times since 07/06/05. Wadi behind ABA, practice grounds! 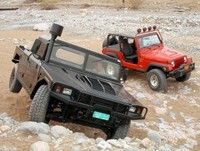 Taking the Jeep's for a quick practice in the Wadi behind the ABA. Found some great terrain to twist the Jeep suspension and look for problems! Last changed on 08/07/15. This album contains 16 items. This album has been viewed 3994 times since 07/03/05. 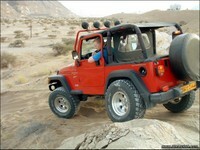 The RoadArmor Jeep Wrangler SUMMIT was first shown to the public at the 2005 Moab Easter Jeep Safari. It's got a 118" wheelbase and a full 6 foot bed, it's one of the biggest Wranglers around! Pictures of this beast and a few other RoadArmor modified vehicles are in here, just because they're badass! Last changed on 09/26/05. This album contains 3 items. This album has been viewed 8108 times since 03/21/05. Last changed on 08/26/05. This album contains 8 items. This album has been viewed 2799 times since 05/21/05.